The eTrex Venture features a 12 parallel channel, WAAS (Wide Area Augmentation System) enabled GPS receiver for rapid satellite acquisition and enhanced accuracy to within 3 meters when receiving WAAS corrections. It includes a worldwide database of cities, and internal memory capacity of one megabyte, allowing it to accept downloaded information from GARMIN's new MapSource® Points of Interests CD-ROM. The CD enables users to download locations such as restaurants, hotels, shopping, and entertainment. Once the information is loaded into the unit, you can make a selection and telephone and address information for a particliar point of interest will appear on the screen. The MapSource CD also includes marine data such as lights, buoys, wrecks and obstructions. Position format: Lat/Lon, UTM/UPS, Maidenhead, MGRS, Loran TDs, and other grids. DGPS Accuracy- Position: 3-5 meters, 95 percent typical; Velocity: 0.05 meter/sec steady state. 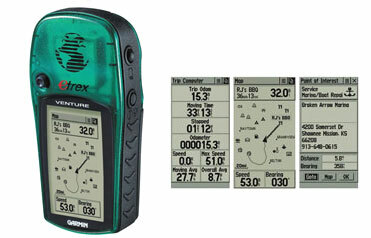 Package includes GPS receiver, eTrex Venture Basemap (City Point Database), PC interface cable, Wrist strap, User's guide, Quick reference guide.